1. That is not My business. 2. Nothing is more important than I." 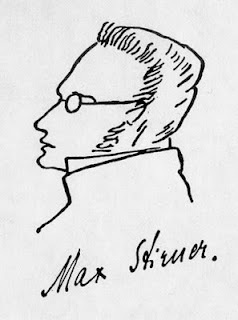 For any readers able to transcend the usual reaction to this as "shocking egoism", I give you below the whole first chapter of Stirner's Der Einziger und sein Eigentum ("The Ego and its property", sometimes translated as "The Only One and his property"). I believe it contains most of what is essential to understand Jünger´s summary of the Der Einziger, and thereby the psychological basis of the anarch. What is not supposed to be my concern † ! First and foremost, the Good Cause, ‡ then God's cause, the cause of mankind, of truth, of freedom, of humanity, of justice; further, the cause of my people, my prince, my fatherland; finally, even the cause of Mind, and a thousand other causes. Only my cause is never to be my concern. "Shame on the egoist who thinks only of himself!" Let us look and see, then, how they manage their concerns—they for whose cause we are to labor, devote ourselves, and grow enthusiastic. You have much profound information to give about God, and have for thousands of years "searched the depths of the Godhead," and looked into its heart, so that you can doubtless tell us how God himself attends to "God's cause," which we are called to serve. And you do not conceal the Lord's doings, either. Now, what is his cause ? Has he, as is demanded of us, made an alien cause, the cause of truth or love, his own ? You are shocked by this misunderstanding, and you instruct us that God's cause is indeed the cause of truth and love, but that this cause cannot be called alien to him, because God is himself truth and love; you are shocked by the assumption that God could be like us poor worms in furthering an alien cause as his own. "Should God take up the cause of truth if he were not himself truth?" He cares only for his cause, but, because he is all in all, therefore all is his cause! But we, we are not all in all, and our cause is altogether little and contemptible; therefore we must "serve a higher cause." — Now it is clear, God cares only for what is his, busies himself only with himself, thinks only of himself, and has only himself before his eyes; woe to all that is not well pleasing to him! He serves no higher person, and satisfies only himself. His cause is—a purely egoistic cause. How is it with mankind, whose cause we are to make our own? Is its cause that of another, and does mankind serve a higher cause? No, mankind looks only at itself, mankind will promote the interests of mankind only, mankind is its own cause. That it may develop, it causes nations and individuals to wear themselves out in its service, and, when they have accomplished what mankind needs, it throws them on the dung-heap of history in gratitude. Is not mankind's cause—a purely egoistic cause? They all have an admirable time of it when they receive zealous homage. Just observe the nation that is defended by devoted patriots. The patriots fall in bloody battle or in the fight with hunger and want; what does the nation care for that ? By the manure of their corpses the nation comes to "its bloom!" The individuals have died "for the great cause of the nation," and the nation sends some words of thanks after them and—has the profit of it. I call that a paying kind of egoism. If God, if mankind, as you affirm, have substance enough in themselves to be all in all to themselves, then I feel that I shall still less lack that, and that I shall have no complaint to make of my "emptiness." I am nothing in the sense of emptiness, but I am the creative nothing, the nothing out of which I myself as creator create everything. Away, then, with every concern that is not altogether my concern! You think at least the "good cause" must be my concern ? What's good, what's bad ? Why, I myself am my concern, and I am neither good nor bad. Neither has meaning for me. The divine is God's concern ; the human, man's. My concern is neither the divine nor the human, not the true, good, just, free, etc., but solely what is mine, and it is not a general one, but is — unique,*** as I am unique.